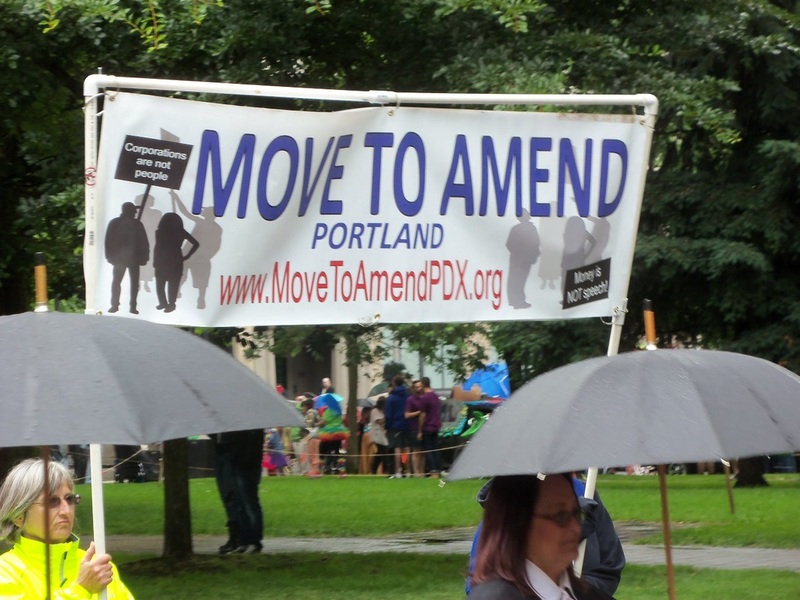 July 23, 2016. Alliance for Democracy and friends in Portland joined the Division-Clinton Street Fair Parade with our anti-TPP messaging. 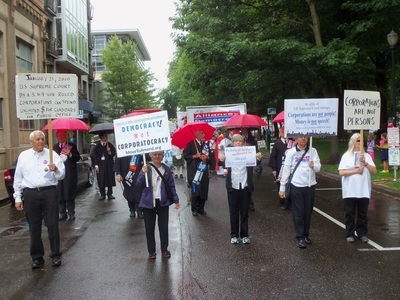 We had our banner, signs and flyers informing people that the TPP is out there and needs to be opposed. 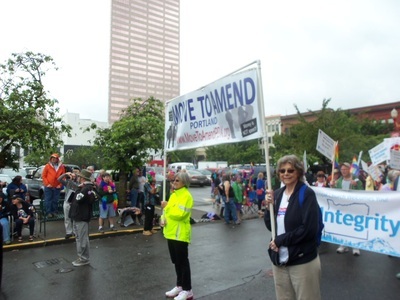 Thanks to Tom & Sally, Barbara, Joan, Jiz, Alex, Bill, Darla, Karen, Jeff, Ethan, Tom, Dawn, Donna and David for showing up and making this a successful day. 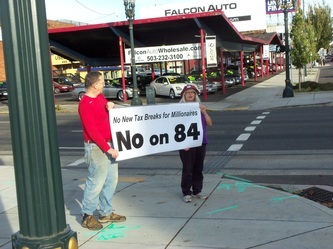 Beginning in February 2015, Alliance for Democracy organized awareness sign/banner holding twice a week at the east end of the Burnside Bridge. 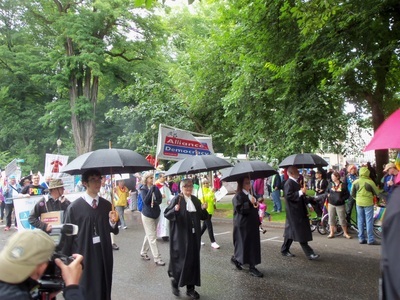 These pictures are from mid-July. 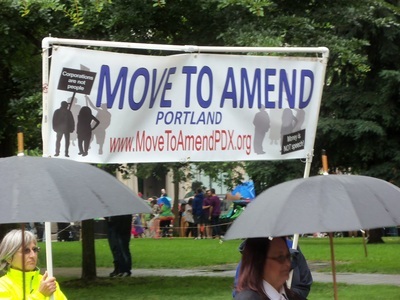 Please join us any Tuesday or Friday beginning at 2 PM at the east end of the Burnside Bridge. 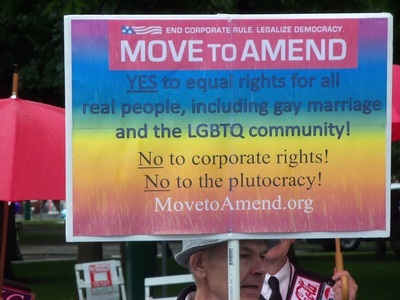 We have the signs; you provide the people. 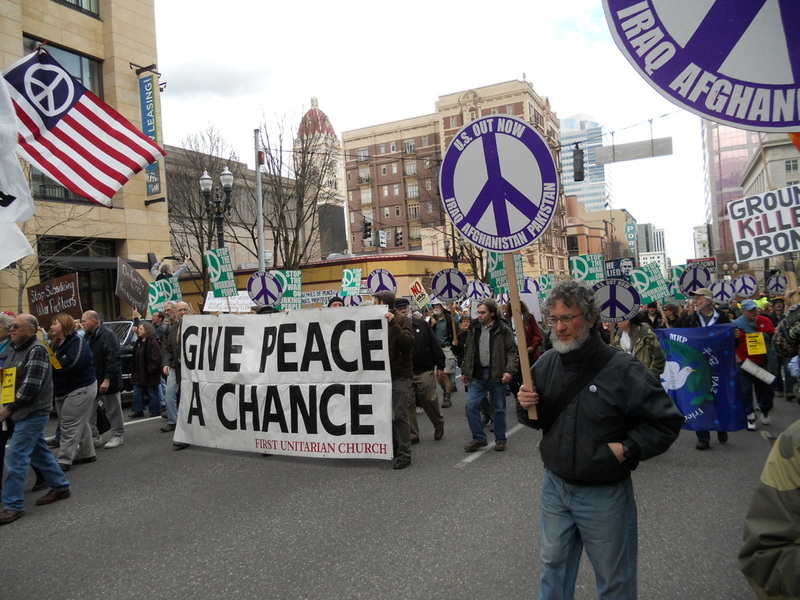 March 20, 2014. 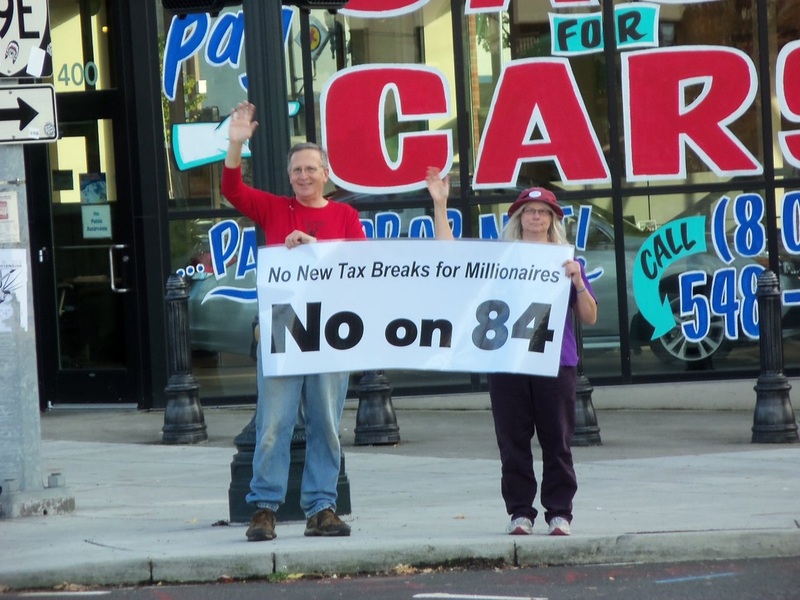 Alliance for Democracy joined Oregon Fair Trade Campaign in delivery of old tech floppy disks to Sen Wyden's office with the message, Just like these floppy disks are old technology from the 20th century, fast track authority is as well. 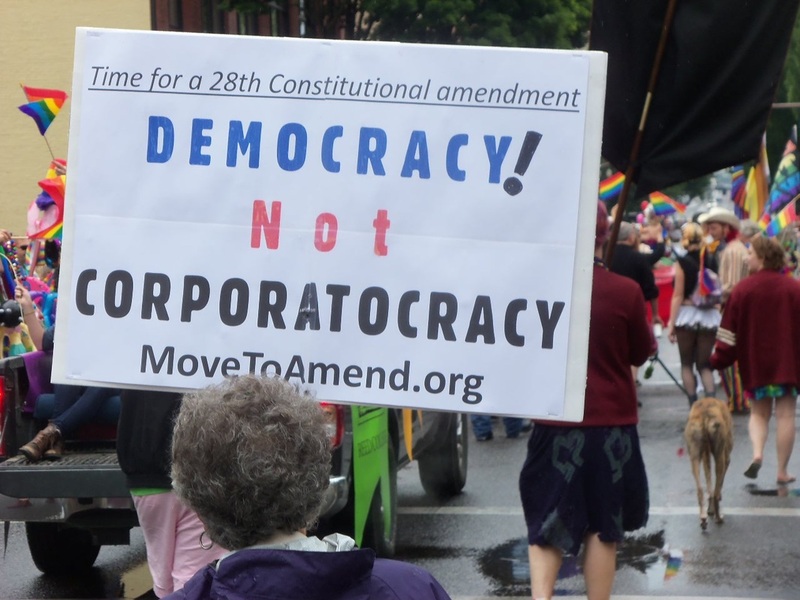 We need new policies for the 21st century, policies that promote democracy, worker rights and protection of the environment. NO to FAST TRACK AUTHORITY! NO TO THE TRANS PACIFIC PARTNERSHIP! 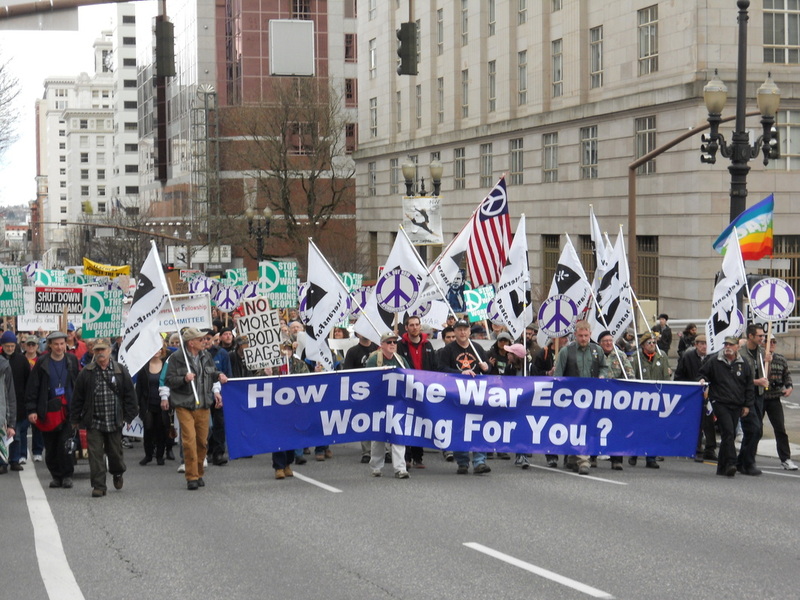 January 1, 2014 was the 20th anniversary of NAFTA. So on January 31, people across the US, Canada and Mexico gathered to protest the effects of NAFTA, and to say No to the Trans Pacific Partnership, Pres. 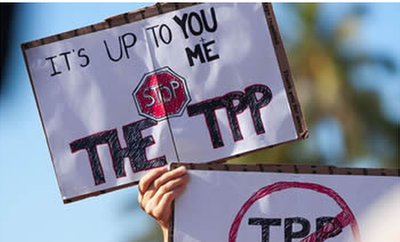 Obama's secretly negotiated 12 nation corporate trade agreement. 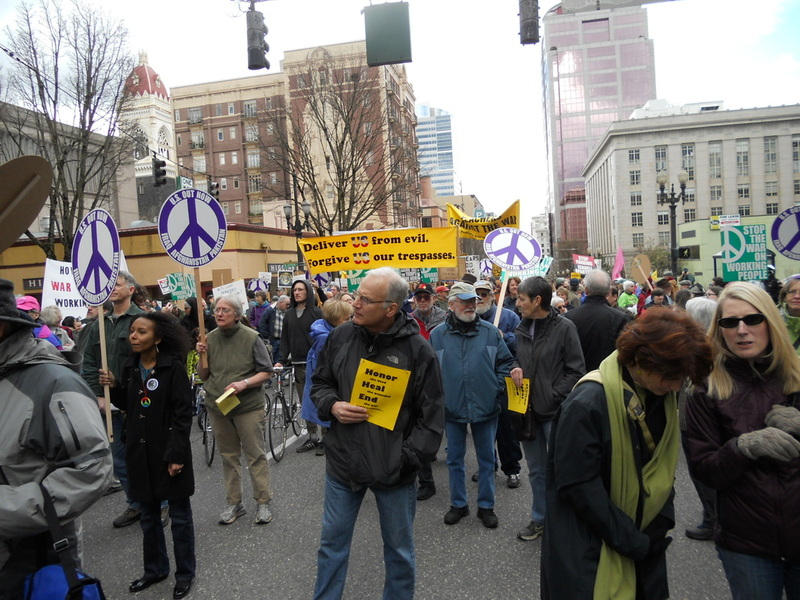 We gathered at Portland State University and then marched downtown. Some of us then took the MAX train to the Beaverton office of Rep. Bonamici. 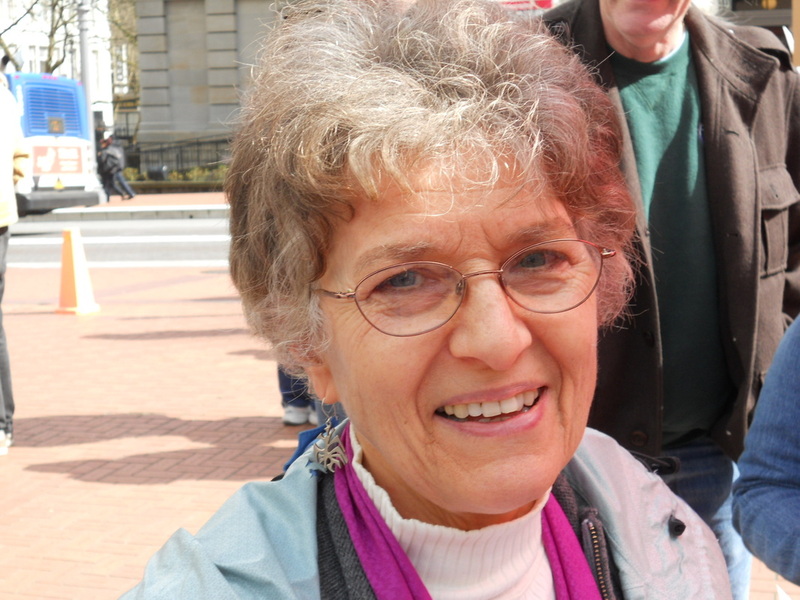 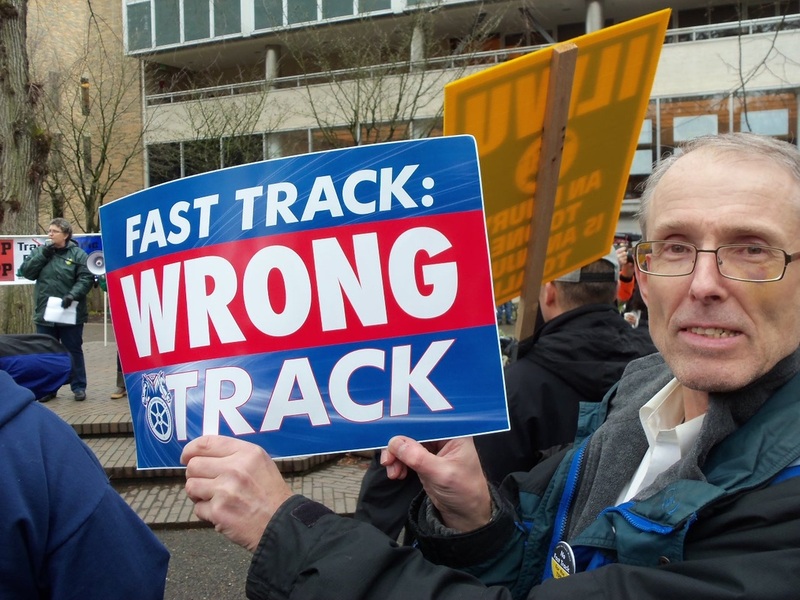 She is the only Oregon Democrat not to state her opposition to Fast Track Authority. 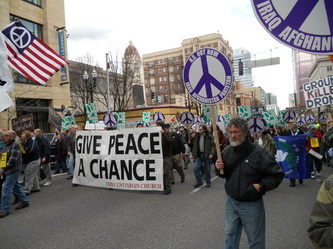 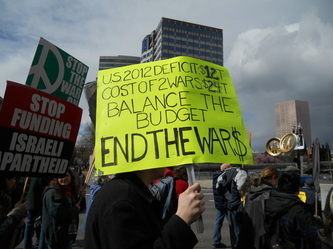 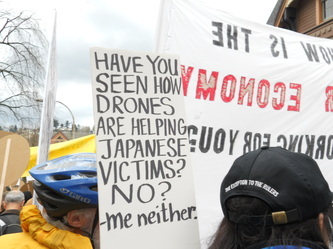 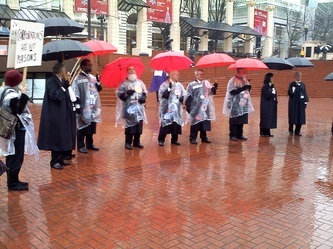 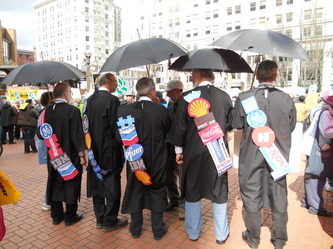 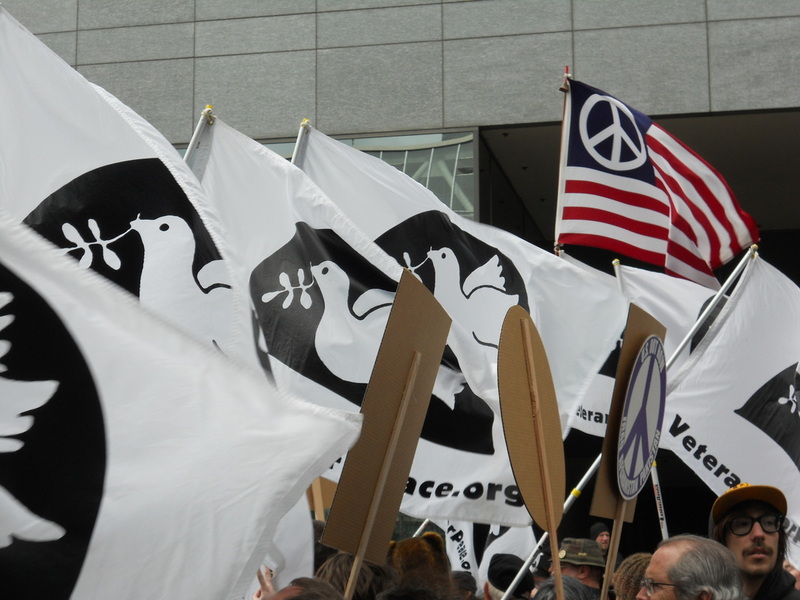 This rally was jointly planned by Alliance for Democracy and Oregon Fair Trade Campaign. 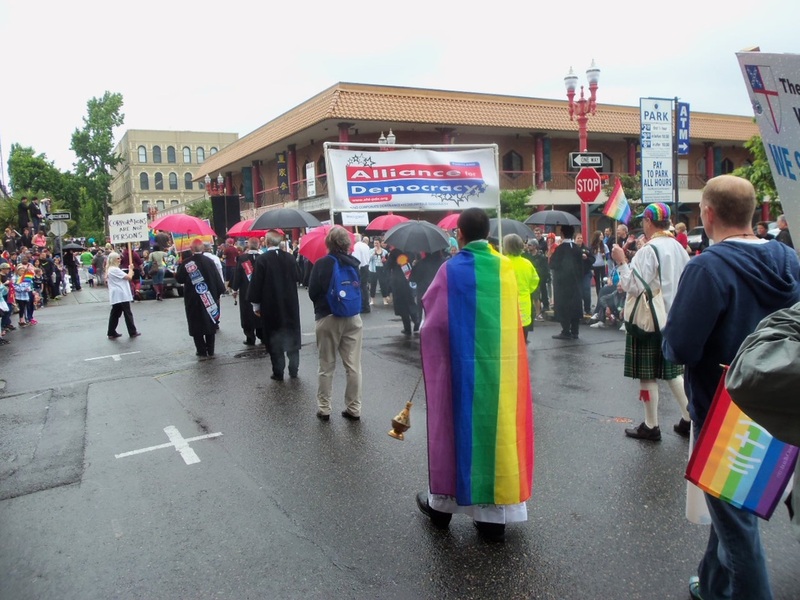 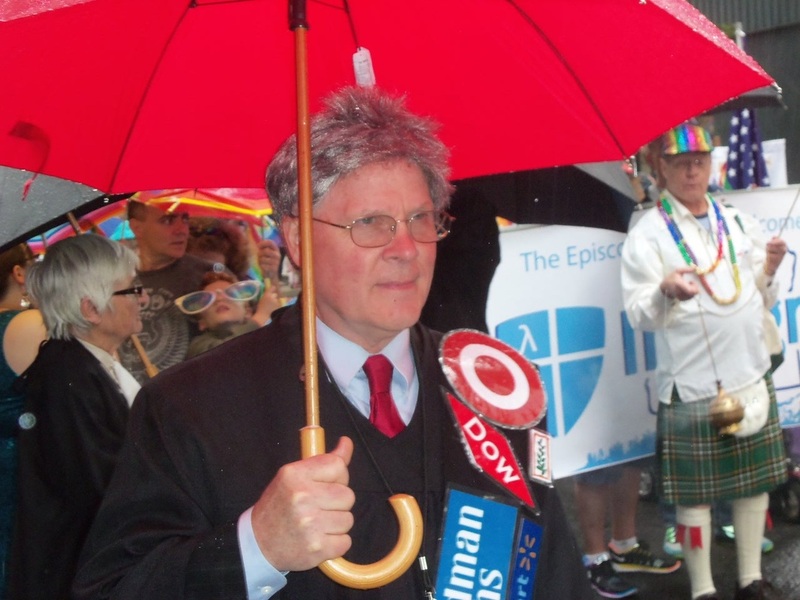 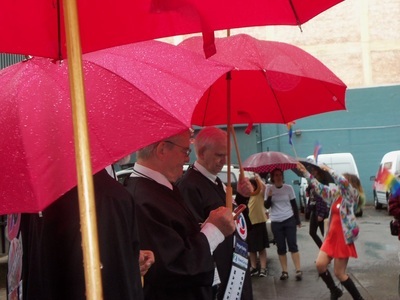 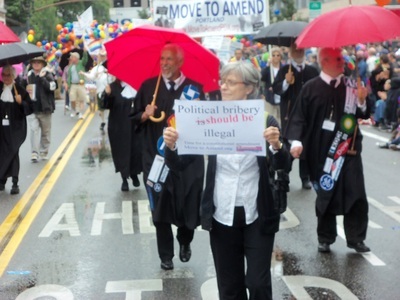 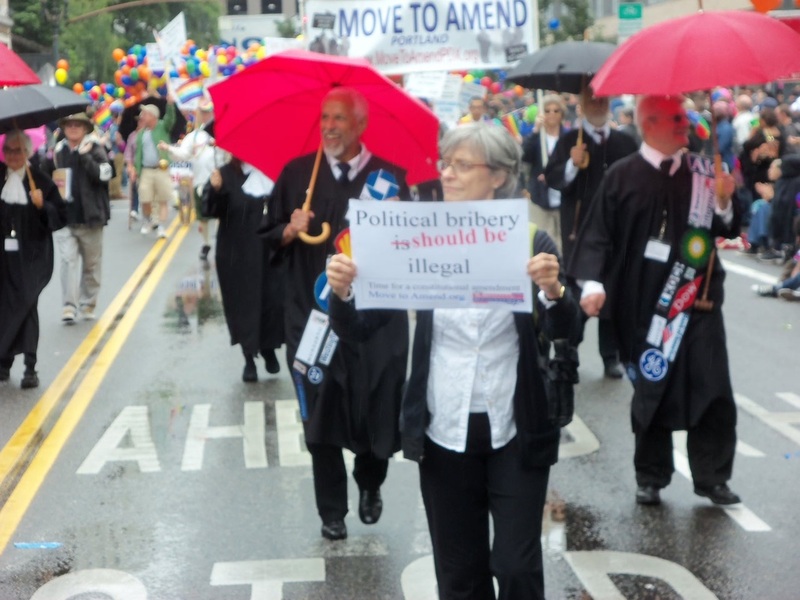 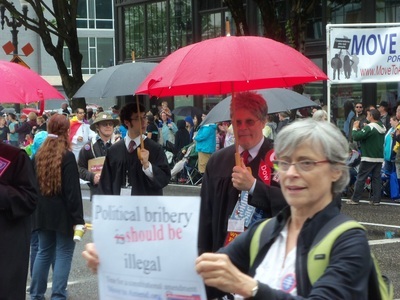 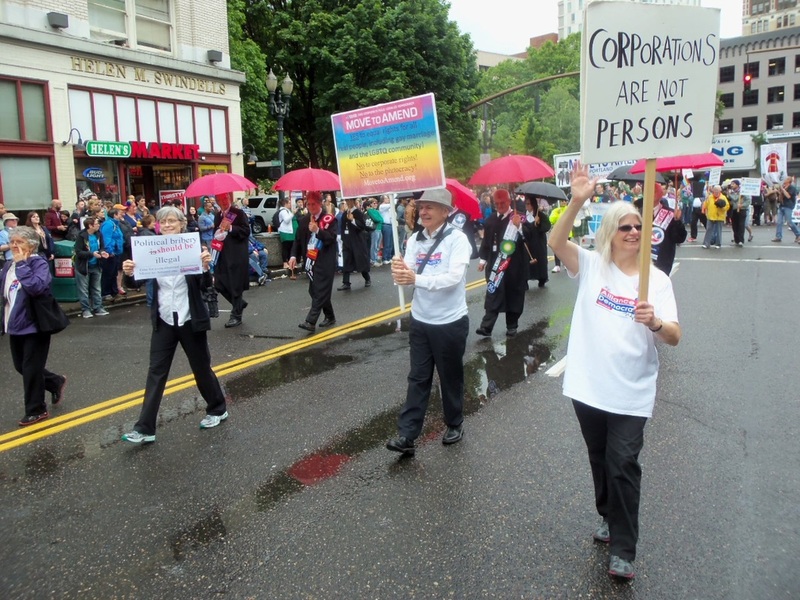 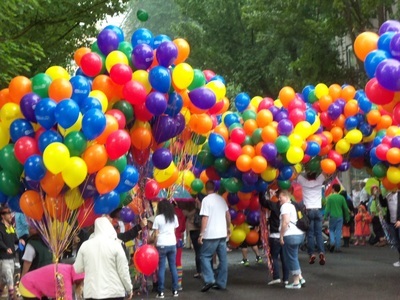 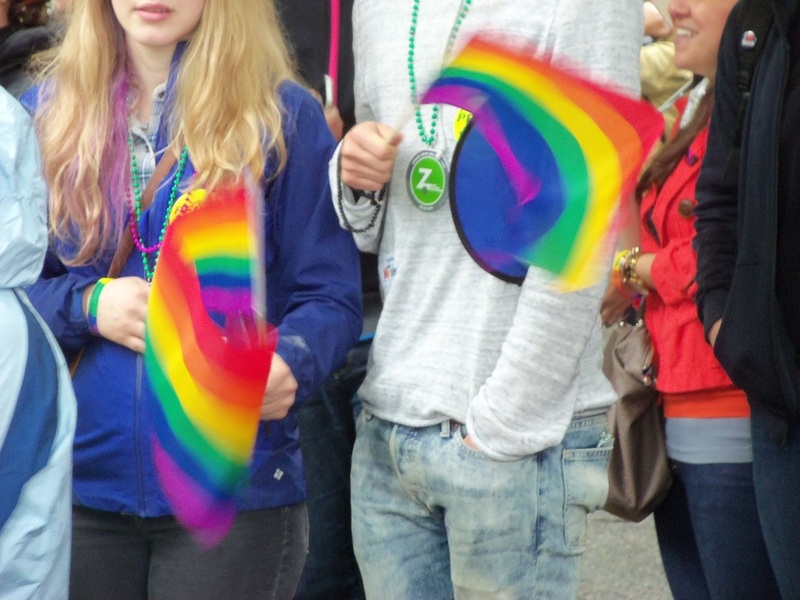 Once again the Alliance for Democracy's Justice Rambles took to the street with the Gay Pride Parade on Father's Day. 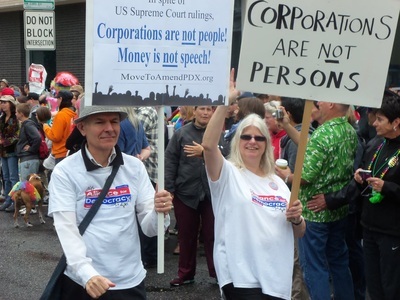 We marched in the parade to spread the work that we need to amend the US Constitution to eliminate both doctrines of corporate personhood and money is speech. The crowd's reception to our message was very positive. 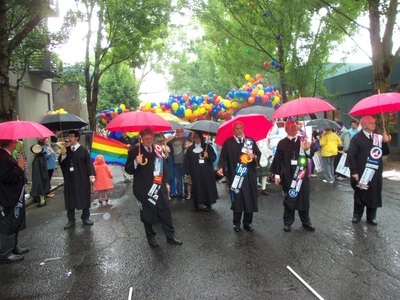 View pictures of us and some of the crowd. 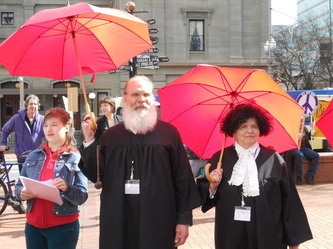 Union postal workers, non-postal union and non-union workers and community allies like the Alliance for Democracy rallied in downtown Portland today in support of a call to save the postal service from efforts to privatize or eliminate the postal service as a public service or, as we say, as part of the commons. 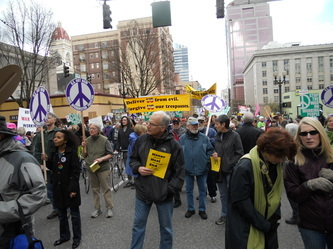 The rally was followed by a march to the Hoyt Street post office. 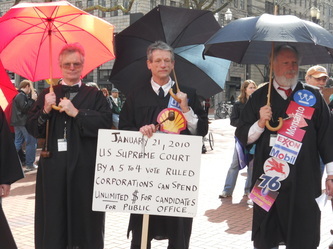 Alliance for Democracy members were there with our banner as well as fliers promoting the upcoming appearance of Thom Hartmann and another one calling attention to the Trans Pacific Partnership, Obama's new "free trade agreement," currently being negotiated. 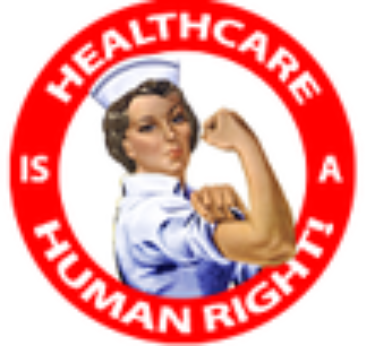 See our Campaigns tab for more information on this. 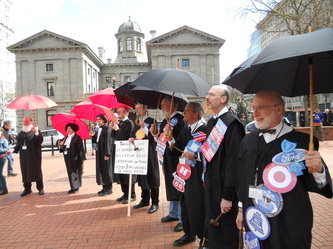 Alliance for Democracy members and about 1000 other Health Care for All Oregon coalition members gathered on the steps of the Oregon state capital on opening day of the 2012 legislative session to advocate for single payer healthcare. 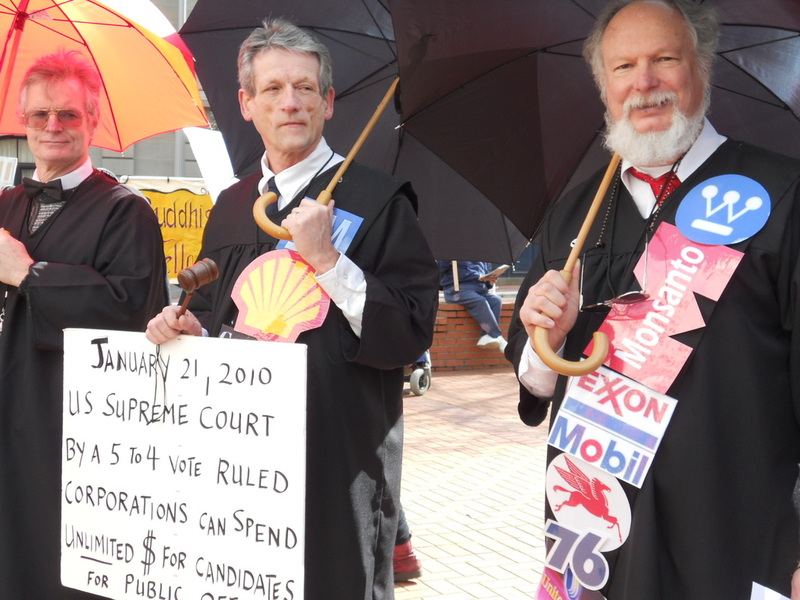 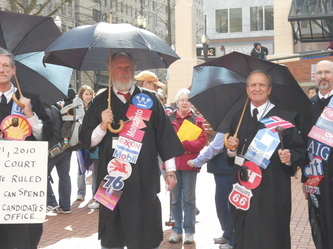 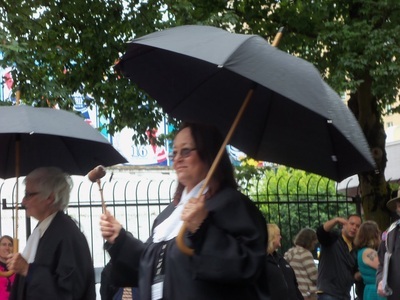 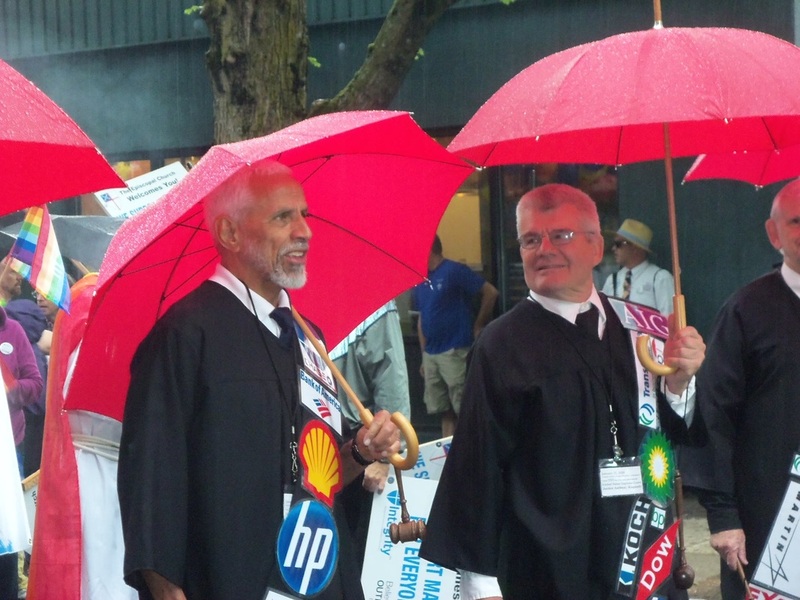 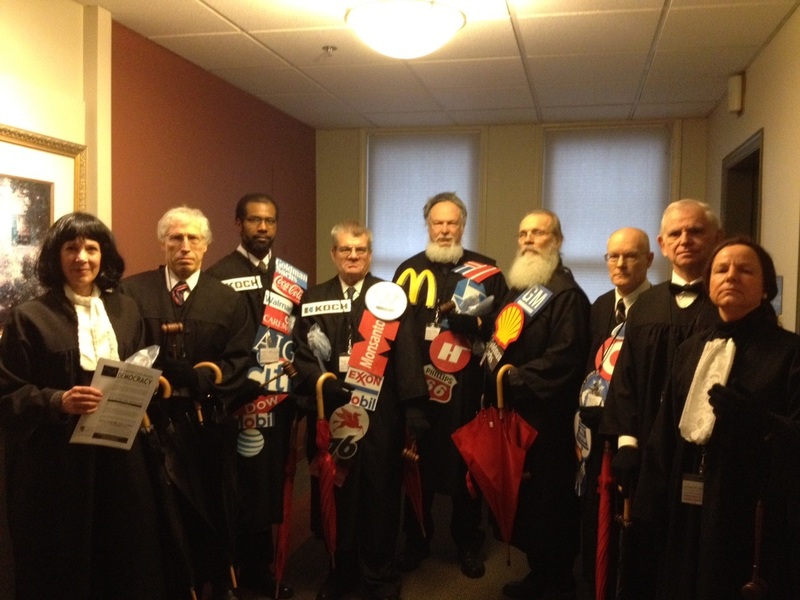 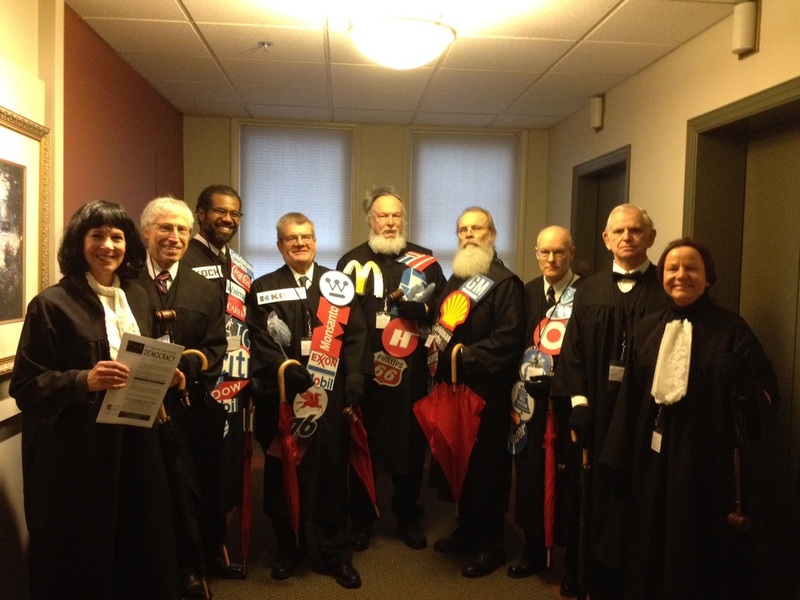 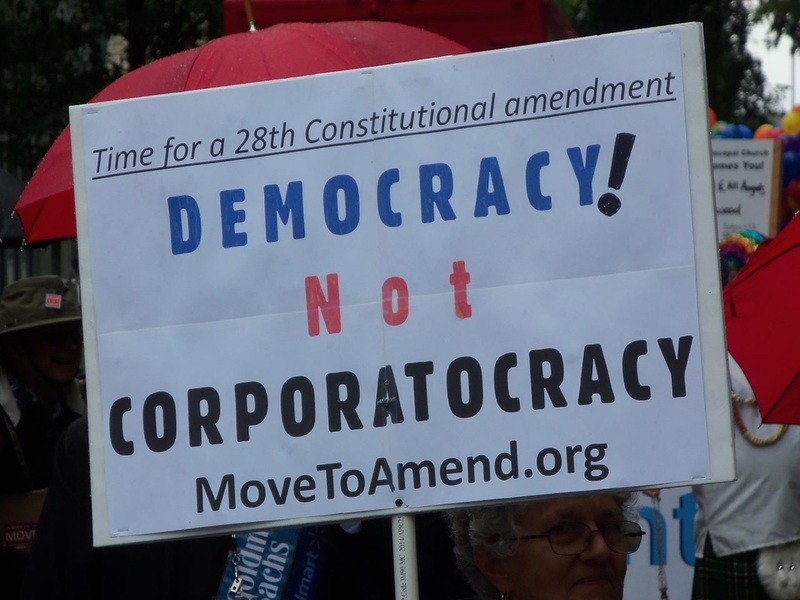 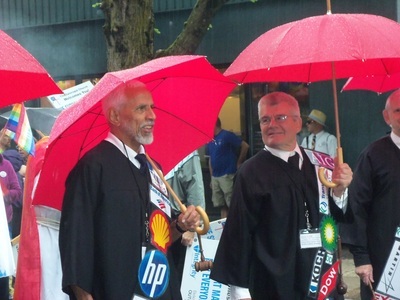 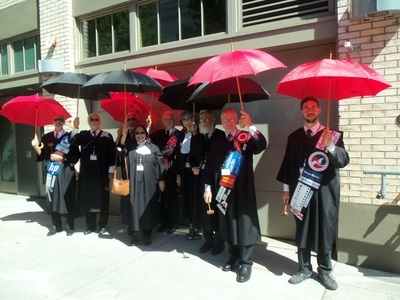 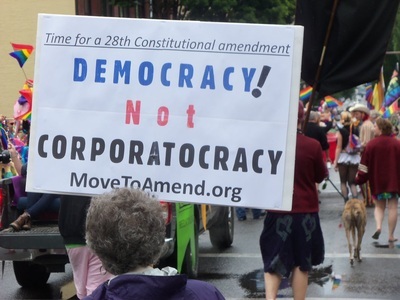 Alliance for Democracy send down their US Corporate Supreme Court Justices complete with their corporate logos to demonstrate the connection between the corporate power behind the existing system and the need to end corporate personhood and the doctrine that money equals speech. Rep. Michael Dembrow has introduced Affordable Health Care for All Oregon Act (LC 1914) into this new session with 19 co-sponsors. 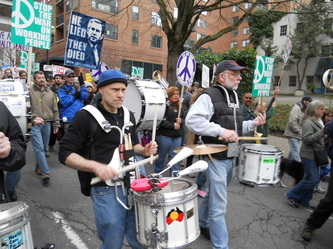 Alliance for Democracy Oregon members traveled by bus to thre Peace Arch in Blaine WA on Dec 3, 2012 for a rally and summit with others opposing the TransPacific Partnership (TPP) from Washington state and from Canada. 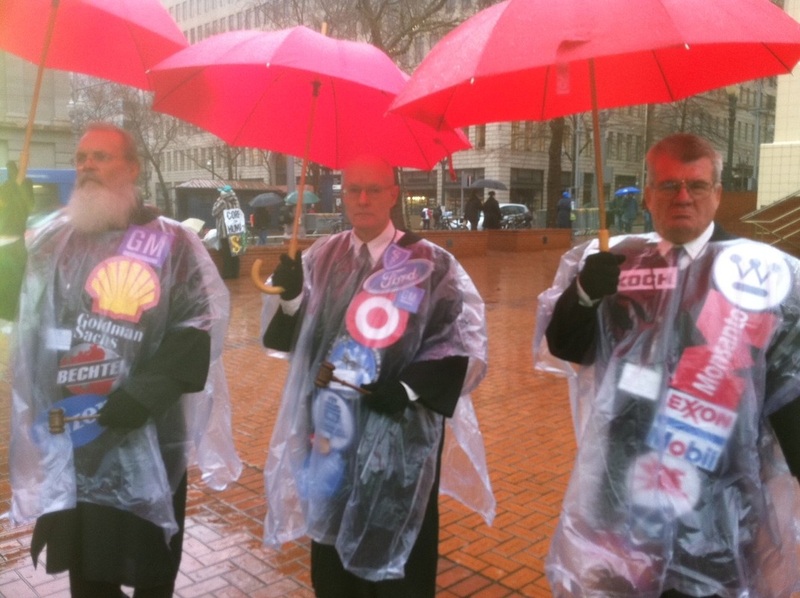 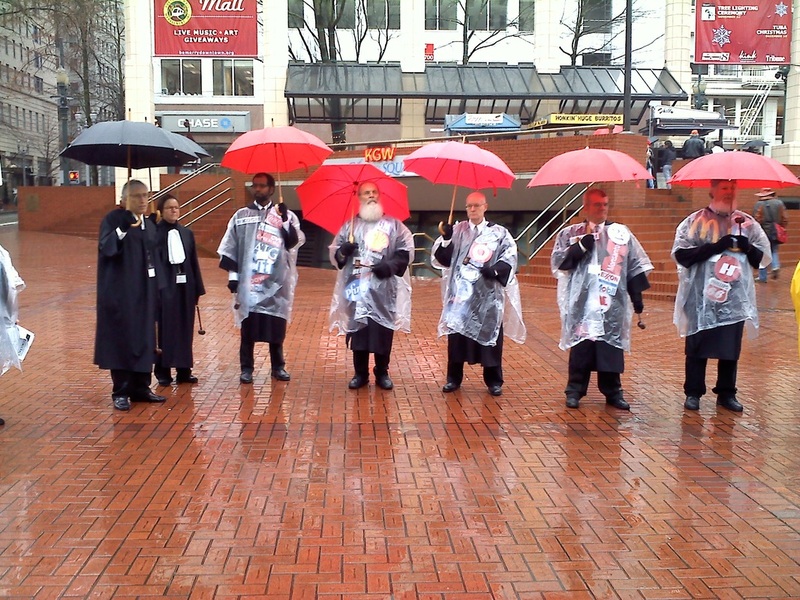 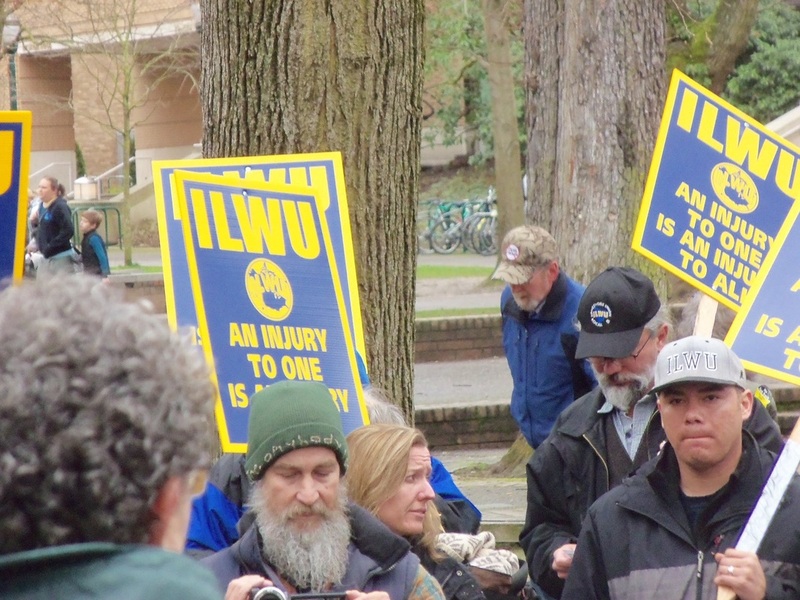 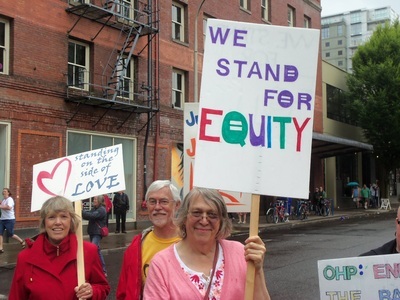 We joined our friends from the Oregon Fair Trade Campaign and many unions in Oregon to make the trip. 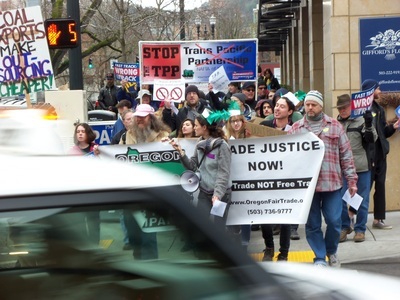 In the end we decided to get at least 1000 organization sign-ons to a tri-party statement opposing the TPP. Read the statement here. 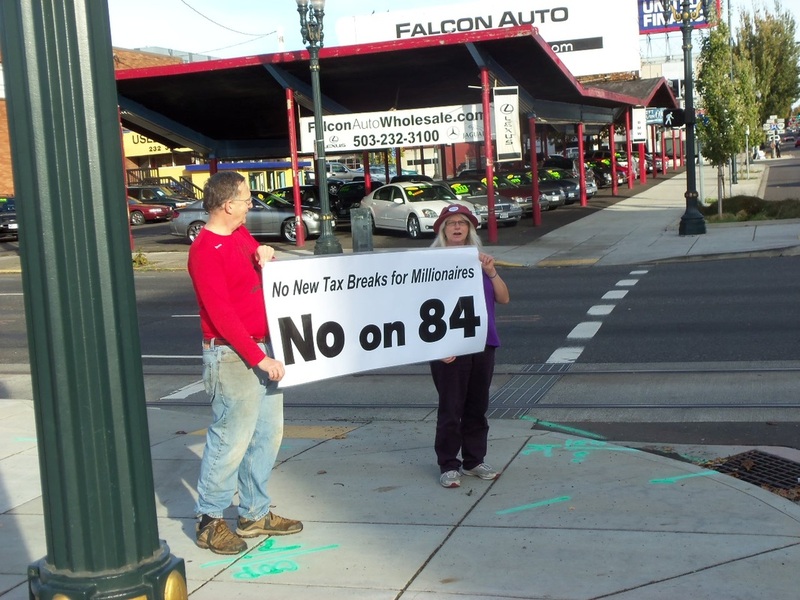 Pictures of Alliance for Democracy supporters bannering at the Burnside Bridge calling for No vote on Measure 84 which would eliminate the Oregon estate tax and create a new tax loophole for the top 2%. 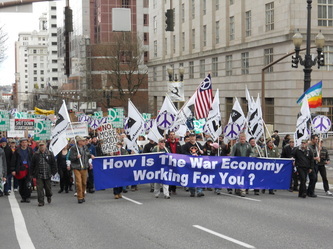 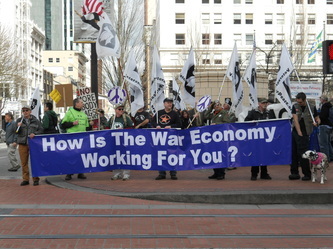 The People of Portland gathered in Shemanski Park in downtown Portland to protest the beginning of the 12th year of war in Afghanistan. 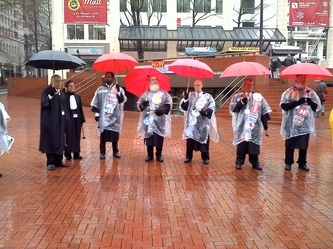 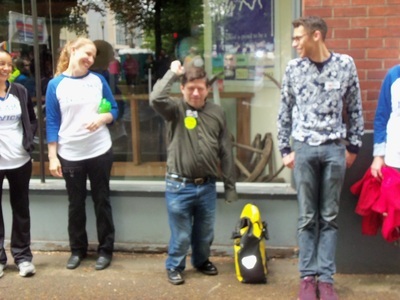 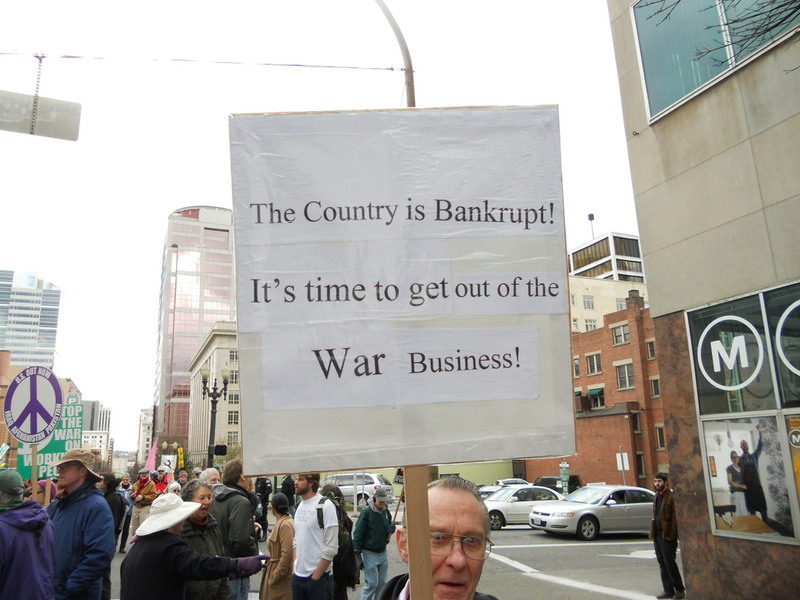 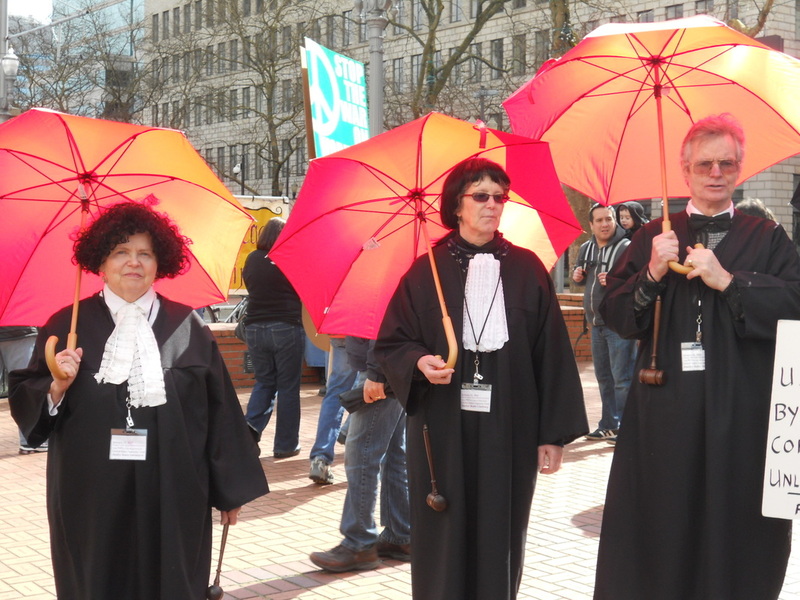 We also celebrated the first anniversary of Occupy Portland. 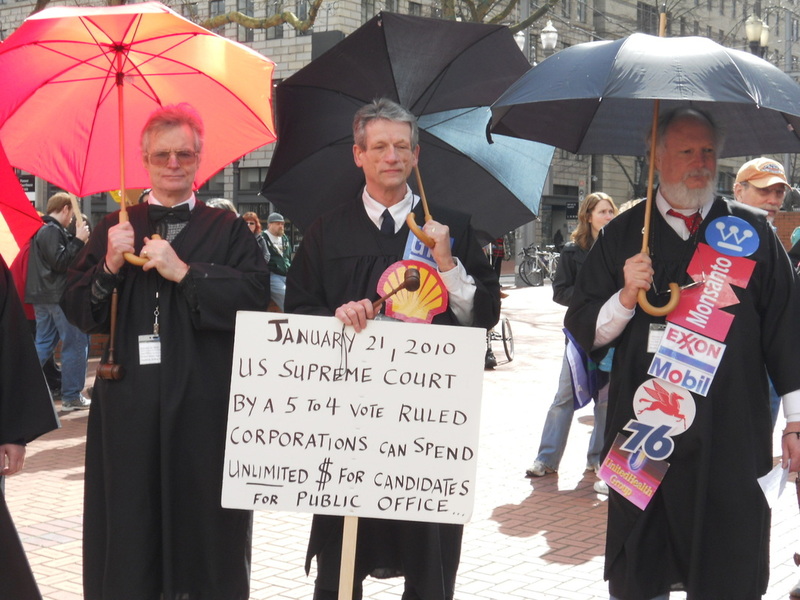 One Alliance for Democracy project is the US Supreme Corporate Justices. 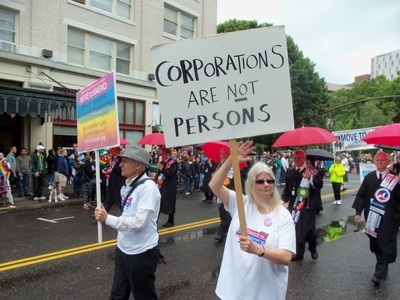 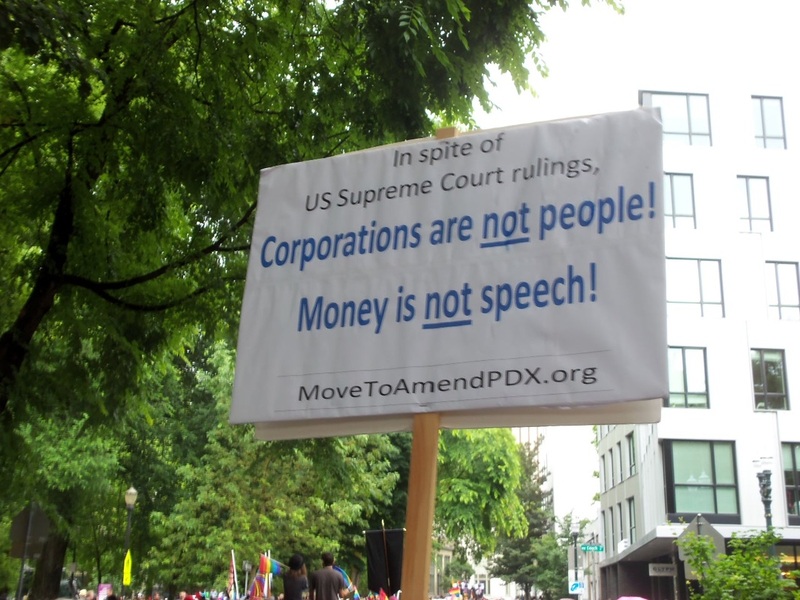 We show all at rallies, marches and other public events to draw attention to US Supreme Court decisions which have established that Corporations Are People with human rights, and the doctrine that Money is Speech.